Your bathroom is a key part of your home—it’s where you prepare for a long day ahead, freshen up before a date, and wash away stress. Because you spend so much time in your bathroom, why not make sure it’s a beautiful space that you love? 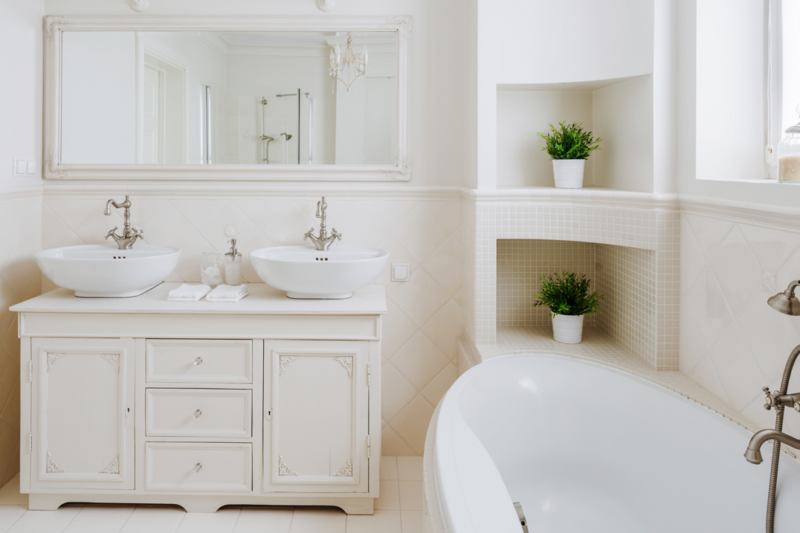 An easy and unique way to upgrade your bathroom is to turn it into a luxurious, spa-like oasis with a Northern Virginia bathroom remodeling project. Here are some of our renovation tips for creating your very own personal spa. Paint color can make all the difference in a room. Lighter cool colors like blues, purples, and greens tend to give off a calming vibe and help make a small space appear bigger. Many professional spas also use earthy colors like darker green, brown, or beige. Use some of these colors in your bathroom for that same comforting, spa-like feel. Be careful when using any warm colors like red, yellow, and orange, since they do not usually help us relax. Or, if you want to use them, try picking more muted, subtle shades. There are a few great ways you can change up your shower and/or bathtub to create your own spa at home. Purchase and install a glass shower door for your walk-in shower or shower-tub combo. Glass helps brighten up the space and adds a sense of flair. You can use completely transparent glass or select something more opaque such as mist glass. If you have a bathtub, try switching it for a luxury tub with built-in jets. Each time you take a bath, just turn on the jets for a soothing and relaxing sensation. A bathtub with jets is perfect for relieving the stress of the day with a long soak. Spas are usually so relaxing because their layout is clean, open, and promotes the flow of energy. To replicate the spa-like feel in your own bathroom, keep your surfaces free of toiletries and other materials. A bathroom sink counter that is cluttered by toothbrushes, curling irons, combs, and mouthwash does not give off a sense of relaxation. Install cabinetry or built-in shelves to keep toiletries out of sight and out of the way. Every spa needs decorations! The key to creating a beautiful home spa is to pick simple yet elegant decorations that work well together. It’s a good idea to select your paint, tile, and counter colors or materials prior to purchasing decorations. This way, you will be able to select decorations that complement these colors well. Choose one or two bold decorations like artwork or trinkets that serve as the focal point of the room, then pick subtler decorations for the rest. Again, just make sure you use your decorations sparingly and avoid creating clutter. Lighting plays a big role in setting the mood of a room. Although bright lighting is great for brushing your hair or putting on makeup, it can be a little too harsh for a relaxing shower or bath. During your bathroom remodeling project, switch your current lighting for lights with dimming capabilities. With a dimmer switch, you’ll be able to adjust the lights in your bathroom however you would like. Bathroom Remodeling in Northern Virginia with Craft Master Home Design! Craft Master Home Design, a remodeling contractor in Northern Virginia, can make your bathroom remodel dream a reality. We will help you turn your current bathroom into a gorgeous and soothing home spa, with either a complete renovation or simple upgrades. With our unparalleled dedication to quality and customer service, you can be sure you’re in good hands. Turn your bathroom into your own personal spa for the utmost relaxation. Contact us online or call us today at (703) 209-5828 for bathroom remodeling in Northern Virginia!